I think I will be able to alter these to my preferences. 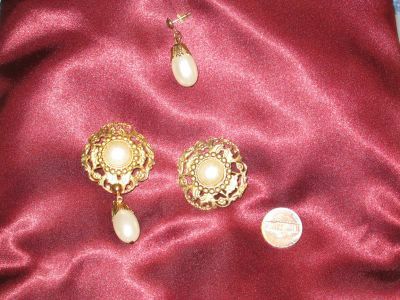 I especially like the look of the teardrop hooked to the bottom of one of the big gold ones. I'm thinking one of these would make a nice brooch for the center of the bodice like i've seen in some portraiture. I was also quite happy to find several cups that interest me greatly for faire days. 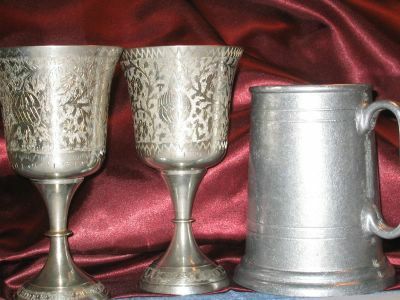 For hubby, a rustic pewter mug to match his scottish attyre, for me a pair of fancy silver goblets. The goblets had me ecstatic. 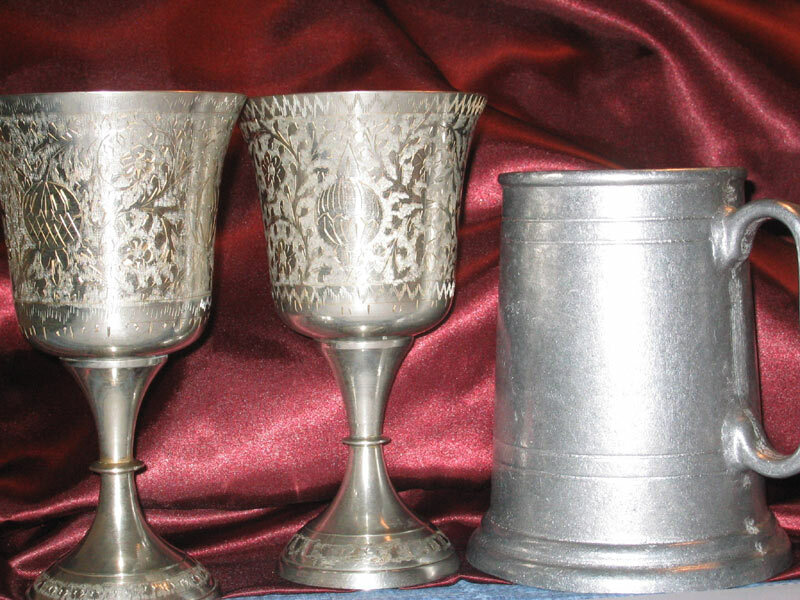 They look hand etched, are from india, and are heavy and cleaned up very well with my anti-silver-tarnish cloth. A mere 3 dollars. YAY for goodwill! Those earrings are perfect and the pearl dangle at the bottom sets it off just right. I'm a pearl freak too, luv them pearls! You know, if I'm going to be watching your diary I should probably get an account here! I've been trying to figure out what to do about a drinking vessel. I suppose my "rustic pewter mug" won't work so well, eh? I just can't see my, erm....rustic little town....having that kind of thing at Goodwill, but I guess I can try. Then too, I suppose I can check the store that sells incense and anklets to the freshmen. Oh, and Lydia....if you decide to do a dress diary, I can assure you of at least two loyal fans. That Tudor is gorgeous. I always check my yuppie goodwill with its silver section for such goodies. Beth--I'll keep an eye out for you on later outings! I looked this time, but only 2. Wanna borrow one for June? Adam won't need it. Thanks Beth! I do have a dress diary for the Tudor but I haven't posted it yet. I keep saying I will put a web site together but haven't done so. I didn't keep much of one for the Venetian. Will try to do better with the Elizabethan!